Creative Alliance of Traffic Engineers, Online Traffic Data | Traffic Engineering Inc. 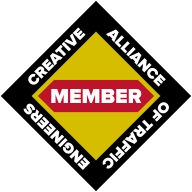 The Creative Alliance of Traffic Engineers is an international organization of cutting-edge traffic engineers who leverage an average of over 20 years each of industry expertise, insights and ingenuity. Founded by Chet Skwarcan, CATE was developed to solve a worldwide problem for engineers and clients alike by providing international reach and scalability to support projects of any size, while preserving the personalization and service that comes naturally with small business owners. Wherever there is a traffic capacity or traffic safety concern, a traffic study makes sense. The question is, what should a traffic study include to provide an accurate assessment and recommendation? No two traffic studies are the same. The scope of each study is determined by the several factors including: existing conditions, planned improvements, accessibility, continuity & driver expectancy, and technological trends. Online Traffic Data was created in 2009 as a collaborative database for traffic information. Every agency knows their own traffic volumes but no agency knows everyone’s traffic volumes—until now. Online Traffic Data is an initiative providing methodology for simultaneously viewing traffic data from multiple sources. Several years later, Google created a similar service and in fact uses data provided by Traffic Engineering, Inc.